It lets you easily cut objects into 2 or 4 (theoretically as many as you like) interlocking pieces for 3d printing or laser cutting. IMPORTANT NOTE: Puzzlecut only works correctly when RENDERING objects in OpenSCAD (by pressing F6)! Just previewing your object (by pressing F5) will not produce usable results! I created it after realizing a project I was working on wouldn’t actually fit on the bed of my soon-to-be-shipped Replicator 2. There are a few other tools that do similar things – but they didn’t have the flexibility I wanted. Position puzzle cuts anywhere on X and/or Y axis. Code should be easy to tweak if you want more than 4 puzzle pieces / different angles / or bunny-rabbit-shaped cuts. Have that particular file shown above? I'm trying to make more than one y cut to split up a particularly long piece into smaller segments. I can't figure out how to move the location of the y cuts. Can you give any suggestions? PuzzleCut "out of the box" only supports a single Y and X slice. It should be possible to re-apply the same Y slice (identical cut positions) repeatedly by making a module containing a single cut – and then recutting the module. This doesn't however solve the issue of needing to place the actual cut locations differently for the different slices. One work around is to rotate the module 90 degrees – then apply the X slice to it (which would effectively be on the same axis as the Y slice). That would let you position one additional set of cuts. I have thought about adding better support for multiple slices to the library. If you want to send me your model as a test-case – I'll see about adding the functionality in the next day or two. Had a very similar inquiry from another (the same?) user (see above). In short – turns out it's difficult / impossible to do with the current version. BUT – I just put together a tweaked version of the library which allows you to make as many unique cuts as you like on either axis. Anyone who would like it sooner can just email me directly (email link on nothinglabs.com). New version up on thingiverse now supports this. Have fun! This is so cool! I'm playing with a miniature DIY laser (diode) cutter and the lack of space is a perennial issue. I tried doing parting of the large shapes by hand but this is the one operation that just begs to be automated. That said though, every once in a while I would need some parts of the cut to come through a particular region, and very precisely positioned, too. Does PuzzleCut allow for some kind of a combination of automated and manual positioning of the shape boundaries? Sort of like an automated PCB board layout where you'd let the CAD system do an automatic layout but then come back, rip up a couple of traces that have to be in the presice spots and route them manually? And another question: can you account for the tool diameter for a tight, friction-held fit? Like, compensate one part positively, then compensate the adjasent part negatively so when you cut them and put together, they'll be sure to fit tightly? 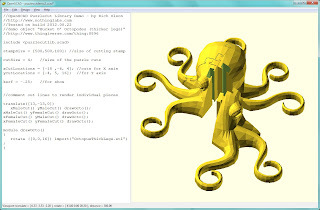 PuzzleCut is a relatively simple OpenSCAD script. It doesn't have a lot of smarts – basically you're plugging some variables in to manually position the cuts. So – the answer to all your questions is "yes – but you'll probably need to tweak the code a bit yourself"
The limits are really how much you're willing to hack things / the limits of OpenSCAD itself. I'd download the script and play with it a bit. 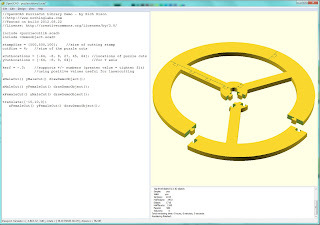 OpenSCAD definitely can extrude a DXF file – cut it – then smash it back down to a DXF. That might be useful for laser cutting stuff. I have a part that is 9.57 high, 112.18 wide, and 171.74 Long. I am having a bit of trouble getting it to cut. Is there anything else I should be considering? I appreciate the help. Alternately – you might try rendering the “stamps” independently to see where they line up. For some reason when I try to run this it will cut my object but it doesn’t add the connector pieces. Any idea why this would be happening? This is only happening on 1 file, other files i download from thingverse work fine, this is my own file. The connector locations have to be specified manually in the script. The positions may be entirely different than the stock objects – so you’ll need to play with the numbers… good luck!